In volumetric analysis (titration), choosing the right indicator for the color change is crucial. What color indicators are suitable for analysis at a given pH value? What colors appear in the change? This clever tool lets you quickly find the appropriate indicators – using just a slide control for pH value. 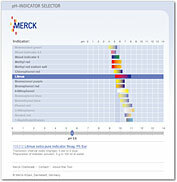 Information on transition interval and on the preparation of the indicator solution is only a mouse click away. Another click brings you directly to our product page with many more product details. No reviews were found for PH Indicator Selector. Be the first to review!